Well it has been a long awhile since we last checked in on Man-Thing; this after the first two issues came out only a few weeks apart. If you have memory troubles like I do you may vaguely remember when we left ol’ Manny (short for Man-Thing) he was confronted with fighting his way through a gaggle of fellow swamp monsters, succeeding for the most part, before witnessing a former ex-gf being kidnapped, all while discovering OldFather was also been taken, against his will, to the Nexus of all Realities. 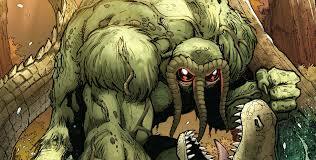 So with all of this these problems to solve and only a few more issues for Man-Thing to accomplish these tasks let’s find out what’s in store for us here shall we. The book starts by picking up in a strange place, which is typically standard for Man-Thing titles, but this is a little bit different. If you’ve been reading along, last issue we saw Man-Thing standing at the gates to the Nexus of all Realities, however the story here seems to have backtracked to a point in time prior to the previous cliffhanger we all saw. Honest to God all we are given in these first eight pages is a Zombie fight before seeing Man-Thing back in front of the doors to the ‘Nexus’ again so halfway through our story we’re right back where we started, that’s just inexcusable. After a brief explanation of how the Nexus of all Realities work, Man-Thing enters the doorway, and what looks like an acid trip turned into a splash page leads us to the first new information dropped on us this issue. The crazy Nexus has sent Man-Thing to place where he has to partake in an arena battle, like ancient Roman times, in an effort to free OldFather. I guess the purpose of all this is for the enjoyment of some Queen we’ve just been briefly introduced to, I'm trying to figure out the WHY she cares, but her motivations are never really even hinted at, so I don't care either. 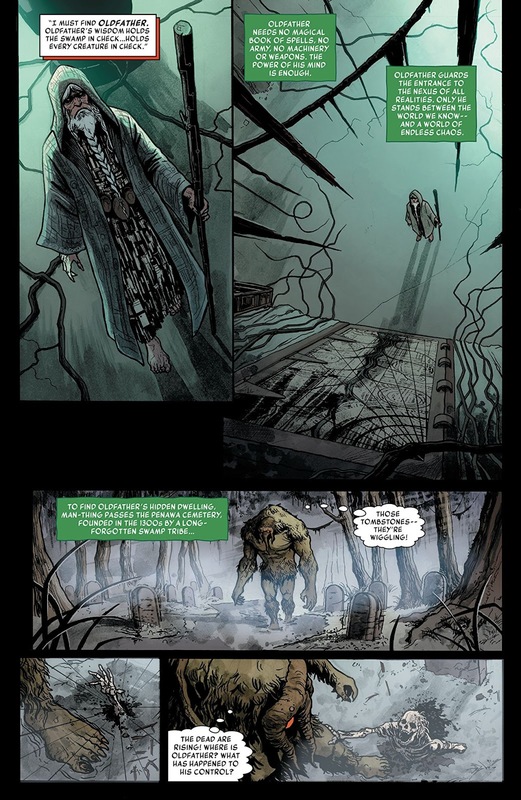 The final third of the book fails to deliver on what seems to be setup, promised, and foreshadowed throughout the issue because just when Man-Thing, and another fellow monstrous titan, are ready to throw down over the life of OldFather, Man-Thing reverts back into his human persona. This obviously takes the other warrior by surprise, he refuses to pick on someone smaller, instead choosing to plunge his own sword into his chest, all to die an honorable death, rather than be goaded into a fight that would make him dishonorable ... okay, I guess its fine, even mindless dimensional monsters have honor, got it. Well if you know anything about evil Queens in literature your mildly aware they don’t like to lose or feel taken advantage of. So despite Man-Thing being the only person left standing in the arena, the queen isn’t happy with the way the course of events went down, and Old Father is still sentenced to death concluding the issue on that cliffhanger. To wrap up events we are provided another several page back-up story, and while I enjoyed the cleverness of the first back-up in issue one, the last two have been largely forgettable since then, adding nothing to the actual story and feel used to add to a page count. 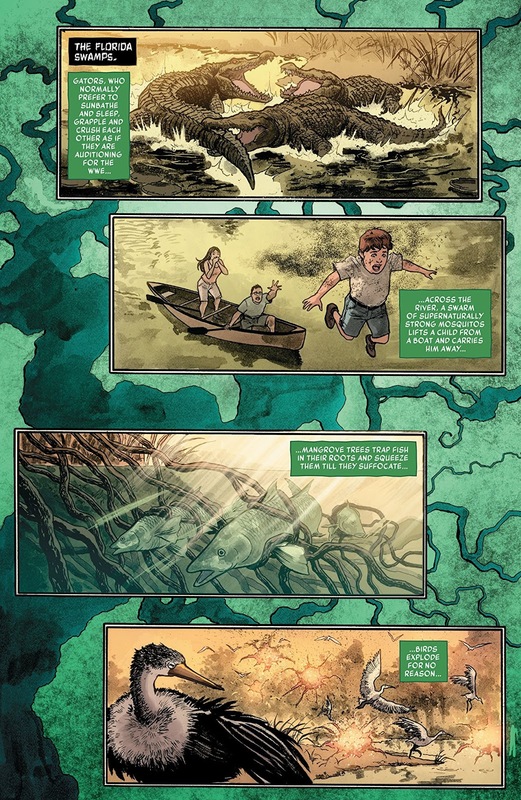 Overall Man-Thing was a title that I was very much excited about in the beginning, but after what seems like a delay in scheduling, combined with a lackluster third issue that mostly just retreads story progress, and worse misleads the reader my interest is waning from this point forward. 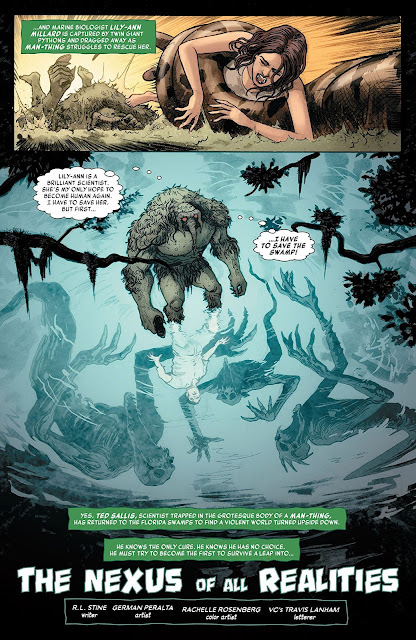 The art remains a strong point of the title, and though it’s fun to see Man-Thing in the Marvel Comics Universe and publishing lineup once again, if the last few issues don’t get back the momentum established in the first two of the series, it might be another long while until we see Marvel’s swamp hero again in the future. Man-Thing seems to have stalled while inexcusably going back on the progress and decisions our hero previously made in the story. I’m not sure what happened from last month to this month but there are characters jumping in and out of the title all over the place and the story in general just seems to have lost its footing in a race to a conclusion.